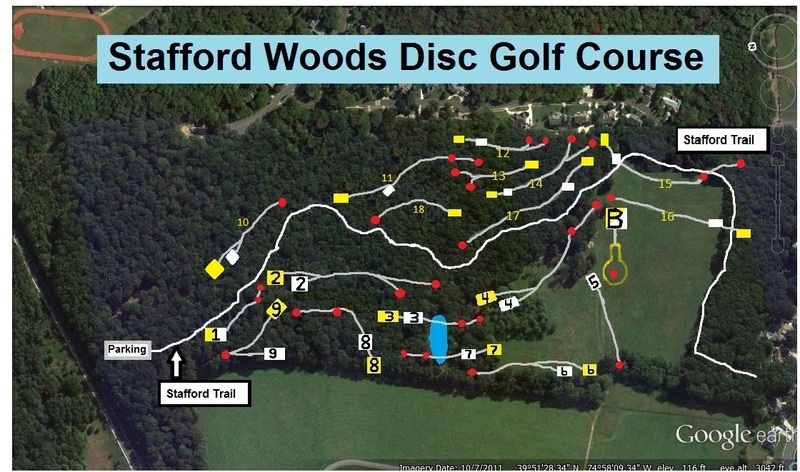 11 wooded holes, 2 pond holes and 5 field holes. 13 of the holes have two sets of tees (for Blue and White level players). Bring bug spray. I-295; exit 32 for Haddonfield-Berlin Rd. (State Rte 561), head SE for 1.7 miles to a left on Evesham Rd. Go 0.8 mile, cross over Springdale Rd. Go 200 yards past Shoprite to a single lane dirt driveway on the right (Stafford Course sign) This leads to parking off Evesham Rd. Well laid out and maintained course. Minor water hazards, short tee setups and intuitive design. One of our favorites courses in this area. Long ones across the field can plague you with wind etc. Over pond from 2 directions, many doglegs left and right. One day 3 under, next week 3 over.